Like Slim Gaillard said, “The Atomic Cocktail” is “the drink that you don’t pour”…until Las Vegas bartenders made it one. You see, in 1951, the government announced Nevada would be home to new bombing test sites. There was, understandably, heightened tension in the area…but then, Vegas knows a thing or two about relieving tension. 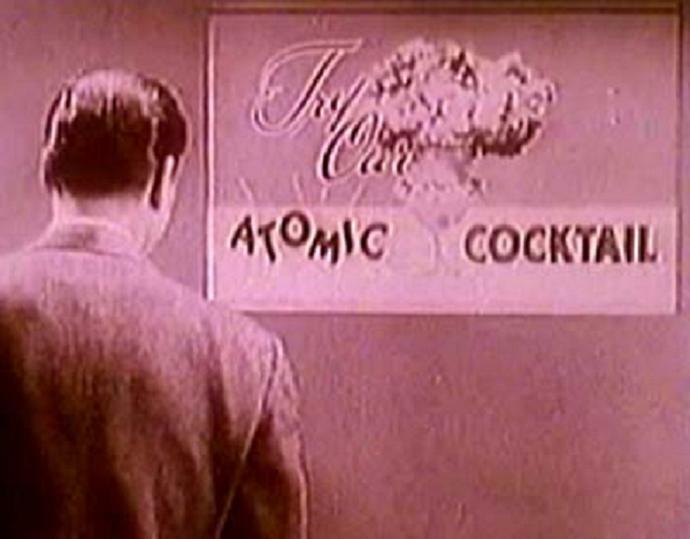 Hotels and bars embraced the plans and the Atomic Cocktail was born. Stir the vodka, brandy, and sherry well with cracked ice, then strain into a chilled cocktail glass and add 1 1/2 to 2 ounces cold brut champagne. Garnish with plastic three-eyed fish from Simpsons playset. Note: If you use the sweeter Spanish brandy, opt for the drier Amontillado sherry. Conversely, if you use the (dry) cognac, choose the (sweet) Oloroso. We strive for balance in all stirs.